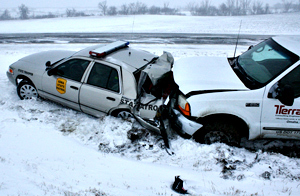 State Patrol car wrecked in crash. Interstate 35 is now open again from Ames to the Minnesota border, but an Iowa State Patrolman says people still need to use caution if they are traveling. Trooper Mark Domino, of the Mason City post, says while the interstate is open again for traffic, road conditions won’t be the best. Domino says traffic can flow once again, but the shoulders and ditches are still littered with vehicles up and down the interstate. He says people need to be aware of the many tow trucks that are working to free wrecked and stranded vehicles that were left on the roads overnight. He says the vehicles are stuck in hard-packed snow and people should look further down the road for the flashing lights of tow trucks. Domino says travel is still not recommended throughout most of the state today, but if you do travel, let people know ahead of time the route you’ll be taking. He says it’s still winter driving conditions, and to let people know when you are leaving and the roads you’ll be taking. Domino says while the interstate is open, several other area county and state roads will not be in as good of shape. He says the two-lane roads are going to be snow-packed and drifted and people need to give the DOT time to get those roads cleared. “People just have to remember, it’s Iowa, it’s winter, slow down and look down the road.” For the latest in road condition information, visit “iowaroadconditions.com“.